Reading takes too long... just show me the 6 photos from this article. I didn't get to experience this year's Seven Seas Food Festival right from the start -- but I'm so glad I found the time to take a stroll-around mid-festival -- before it all ended! There are actually quite a few new items to try out and even a couple of "guest favorites" from last year that I never got to sample! I was really happy to see the "Sampler Lanyard" program still in-place - it really is the best way to experience everything. You can purchase a small "punch card on a lanyard" at a number of locations throughout the park, which allows you to pick up food and beverage items at each of the kiosks in exchange for a "punch" on the card. That way, you're not messing around with credit cards and money and whatnot every time you want to sample an item. It's so much fun. The Sampler Lanyard is still the best deal around... especially for annual passholders. The lanyards are available in three "sizes" -- 5 Items for $30, 8 Items for $40, and 15 Items for $60 -- annual pass holders can make use of a really sweat deal, a special "10 Item Sampler Lanyard" is just $36 (plus tax). It's so nice to see a theme park giving a real "deal" to it's annual pass holders. One of the things I like the most about the annual festival at SeaWorld is that it's always been advertised as "street food and flavors from around the globe" -- and it really does hit that mark. There's no pretense here, it's just a fun time noshing around and sampling different foods and beverage that sound interesting to you. My first stop was at the Florida Market where I picked up a new item to this year's line up, the "Wild Boar Smoked Cheddar Sausage" … and it was great! Probably my favorite out of the five things I tried on my little walk-around. 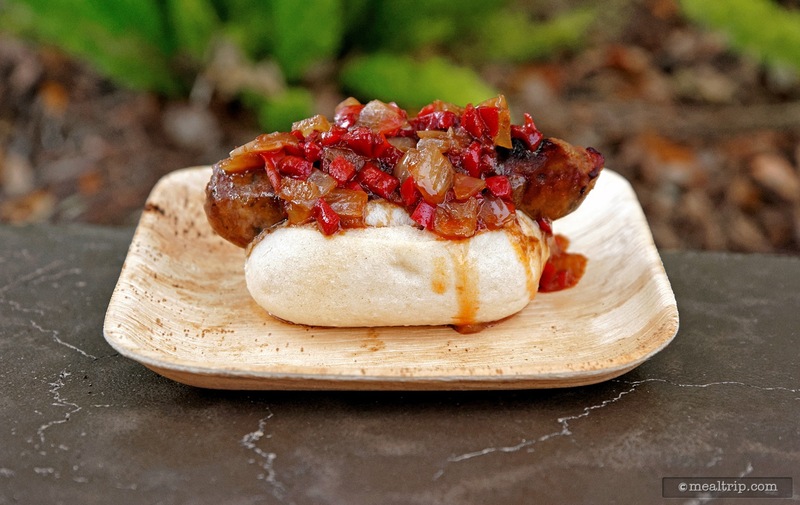 It may not look very large, but the Wild Boar Sausage is quite hearty. The red pepper, onion and balsamic chutney provided just the right balance with the meat. If you like a good solid hot dog with bold flavors, this one gets high recommendations from me. It's great street food, and perfect with a cold beer! 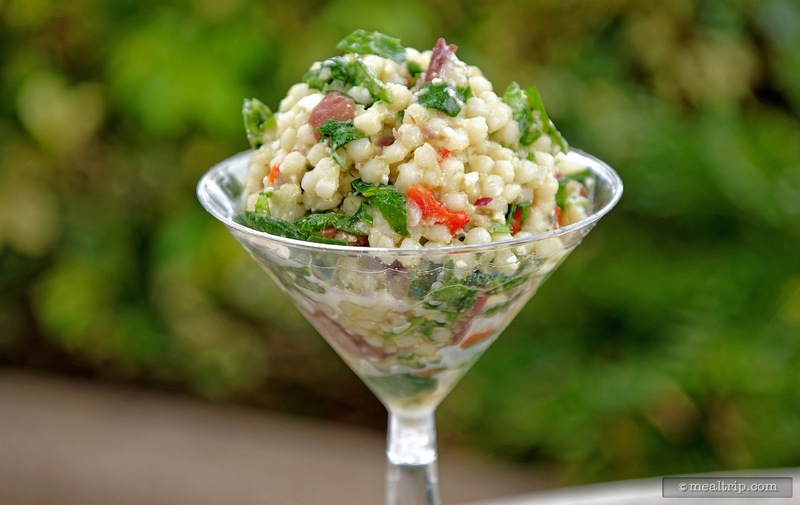 Next, I strolled on down to the Mediterranean Market (think Greek), and got something totally different, but equally as amazing -- it's the Mediterranean Couscous Salad… served in a plastic martini glass naturally! This is another new item to the festival this year, and while I usually tend to gravitate to the made to order items at festivals… this pre-made, served cold, couscous salad sounded so amazing to me after the Wild Boar Sausage, I just had to try it. The perfectly balanced salad combines feta cheese, chopped spinach, olives, sweet red onions and peppers with a white balsamic vinaigrette. It is, a great cold salad - and there's just enough of it in that martini glass to make you feel like it's a full portion. Keeping with the vegetarian theme of my last item, I strolled straight into the most disappointing item of the day -- a beautiful looking, but totally flavorless (and hard to eat too) Grilled Tostada with Vegetable Spread. It's one of two new items at the North Atlantic Market kiosk this year. Now I don't know how they got "tostada" out of this one… all the "stuff" was sitting on top of an un-grilled piece of floppy white bread. It kind of looked like it wanted to be a crostini - but that would suggest that it was crispy in some way … it was not. I guess another reason I'm being so hard on this poor dish is because there are so many ways to make vegetables taste amazing. This was just one of those items that would reaffirm any non-vegetarians worst fears about becoming a non-meat eater. The pasty, heavy eggplant spread had a hummus-like mouthfeel, but without any of the flavor, that seemed to blanket everything like a thick fog. 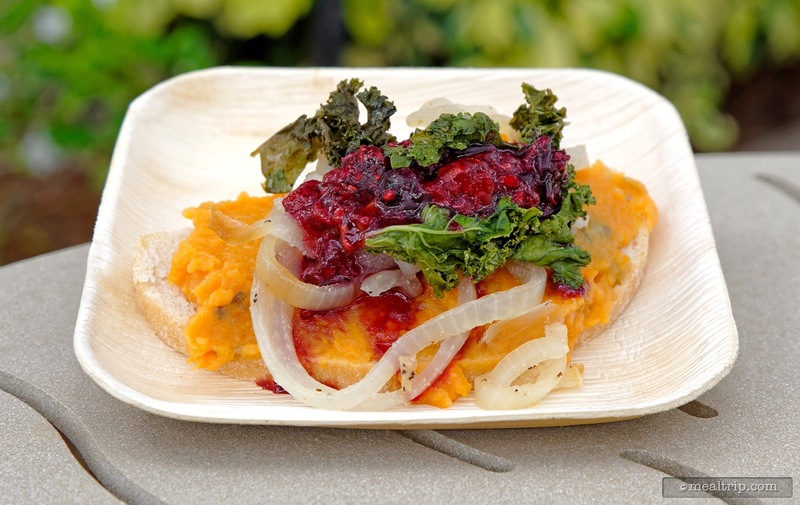 The onions couldn't cut through it -- the wild berry balsamic glaze couldn't cut through it -- and the only thing the kale brought to the party was it's inability to be chewed. Kinda sad, because it sounds so good and looks so pretty. Fortunately, the other new item at the North Atlantic Market booth ended up being a street-food superstar. 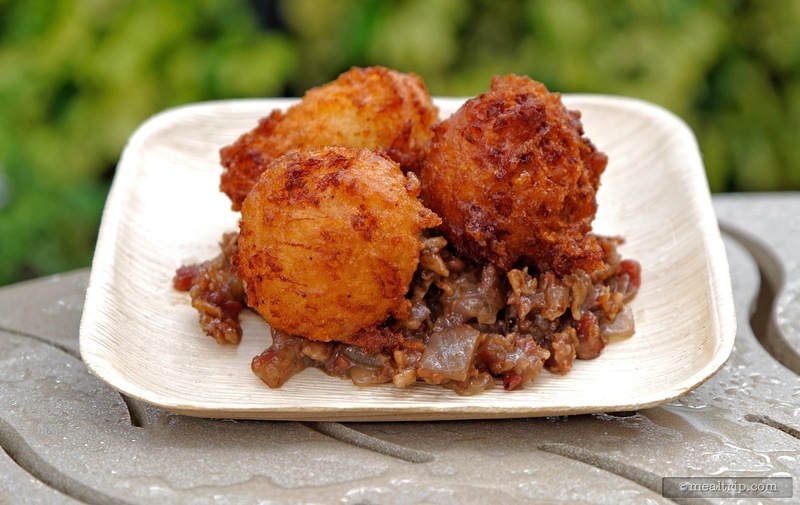 Three Sweet Corn and Cheddar Hushpuppies sitting in a pile of Candied Bacon Jam are probably not very good for you, but they get two thumbs up from me just the same! This is another one of those items that calls for a beer! 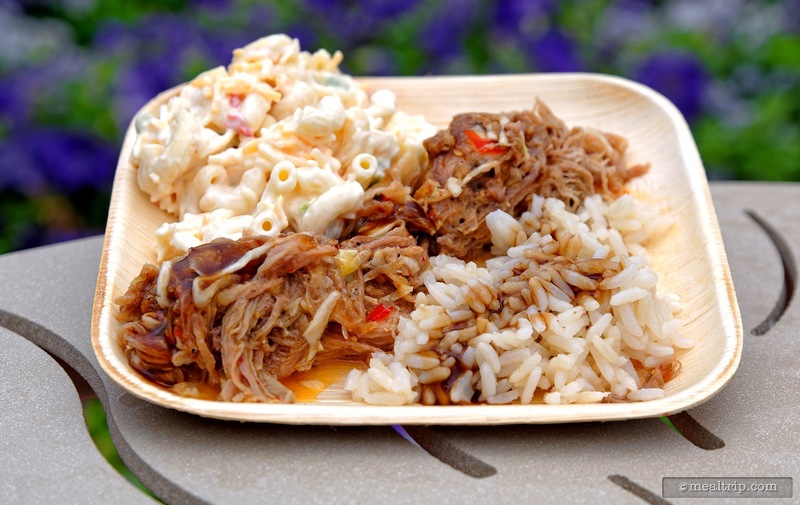 Finally, I made it over to the Polynesian Market booth and tried the new Aloha Mixed Plate which combines shredded Kahlua pork and cabbage with macaroni salad (a delicacy that I don't necessarily associate with Polynesian cuisine, but it was a good macaroni salad) and steamed rice … and… the rice was topped with Lau Gravy …. which is basically pork gravy (you probably don't want to know more)… because it's really good. The pork had a real satisfying craveability about it, and macaroni salad did provide a smooth, cool, slightly sweet break from the unctuousness of the shredded pork. If you're look for something a little different than "western" cuisine, but don't want to go too far into uncharted territory, this is a good dish to try! 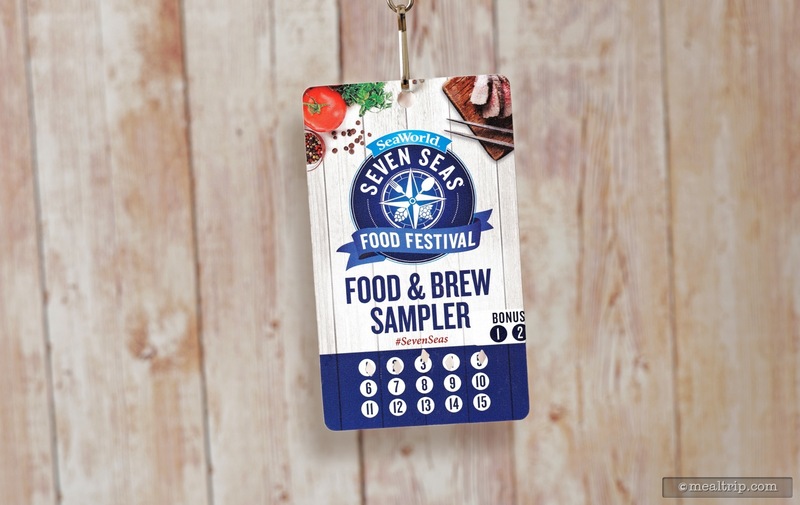 After my first stroll around day, I still have five punches left on my "Sampler Lanyard" -- and there's easily five more things that I would like to try! Stay tuned for my Saturday Stroll-Around Day Two report from SeaWorld Orlando's Seven Seas Food Festival! Check out all the prices before you go! Click here to see our collection of Menu Boards and Prices for the SeaWorld Seven Seas Food Festival. FREE Wine Glass for Disney Annual Passholders at the 20th Annual Food & Wine Festival!